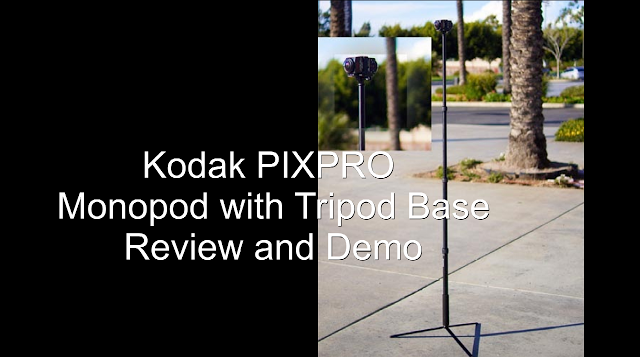 Last week, I posted a review of the new Kodak PIXPRO Monopod with tripod base. Now here is a video review and a demo that shows why I like it. Here’s a larger version. If you found the video helpful, please click the like button and subscribe to my new 360 Rumors YouTube channel. Editing videos like this actually takes me many hours (separate from the time to record the video), so it would be useful for me to know whether you found the video helpful or not. Thank you very much! The Kodak PIXPRO Monopod is available from the Kodakpixpro store here. Disclosure: I bought the monopod myself. Kodak sent me a free t-shirt with my order because I was the first person to order it from their store. However, I’m not affiliated with Kodak and don’t receive compensation from links to their store. In the video, I also mentioned Monoshot. Same thing – I bought one myself and I’m not affiliated with them. Lastly, two alternatives to the Kodak monopod and the Monoshot are the Manfrotto Nano and Nanopole lightstands, which I didn’t mention in the video but which are offered on Amazon and if you buy them through an Amazon link on this site, I will receive a small commission from Amazon (no additional cost to you). Hubblo VR wants to know: what kinds of sample shots do you want to see?